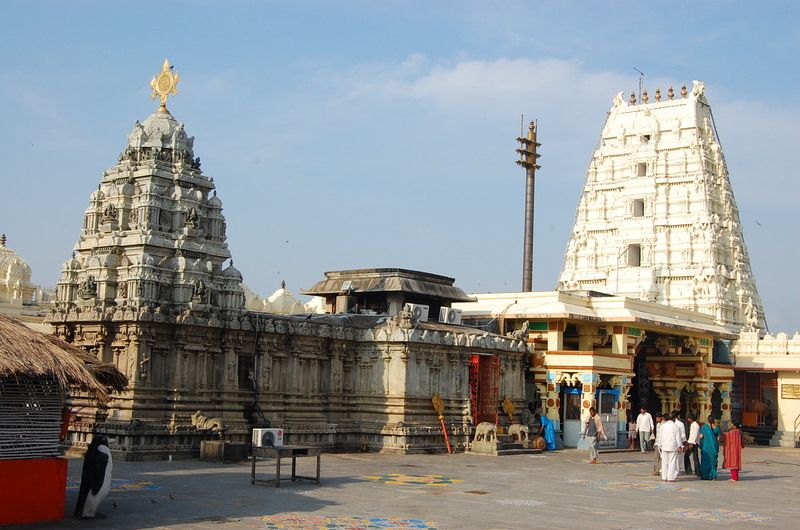 Bhadrachalam is a major pilgrim town situated on the banks of Godavari River in Andhra Pradesh in Southern India. The main attraction is the temple of Sri Ram built by Kancharla Gopanna popularly known as Bhakta Ramadas in 1630 AD. Ramdas was then tax revenue collector (also called as Tahsildar). He collected money from people to build this temple and when the collections were not sufficient, used tax collections and consequently was jailed for 12 years by the king Tani Shah of Golconda (now Hyderabad). Moved by the plight of his devotee Sri Ram and his brother Laxmana repaid the money owed to the king and got Ramadas released. Bhadrachalam is connected by road and rail network. The nearest railway station is Bhadrachalam Road (station code: BDCR), 40 km from the town. Locally, Bhadrachalam Road Railway Station is more commonly referred to as Kothagudem Railway Station. It takes approximately 50 minutes to travel from Kothagudem Railway Station to Bhadrachalam by bus and the fare is about Rs 70. Bhadrachalam is: 120 km from district head quarters, Khammam 325 km from the state head quarters, Hyderabad, where the nearest airport is (Shamshabad) By road from Hyderabad follow this route: Hyderabad – Suryapet – Khammam – Kothagudem– Palvancha (This Is Beautiful Town In Khammam District, Kothagudem Thermal Power Station-KTPS Located in Palvancha Town.) - Bhadrachalam. Buses ply from Vijayawada and other major towns in Andhra Pradesh. If you want to go to Bhadrachalam from Hyderabad by train, you have Secunderbad -Manuguru Super fast express (Train No:17026) at Secunderabad Station every day at 11:45 PM. You should buy a ticket upto Kothagudem (Bhadrachalam Road). The train reaches Kothagudem at 04:25AM. (There is one more train Kakatiya Fast Passenger 57625 which starts 18:40 which reaches at 03:00). From there you can take a bus to Bhadrachalam. There are lots of buses from just outside Kothagudem station. Bus fare is around Rs 20. You can reach Bhadrachalam Town in 50 minutes. While returning you can take Train No:0340(Link Secunderabad Express) from Kothagudem. It departs from there at 10:15 PM. If you wish to travel by Road, there are a number of APSRTC busses which ply to the place. It will be around 315 kms from the capital city Hyderabad. The tourism department buses also ply to Bhadrachalam. It will take you non-stop with a break at the Guest House on the Highway near Narketpally. It will be a 7 hours journey from Hyderabad to Bhadrachalam. Suppose if you start from Hyderabad at 10 PM, you will reach by 5 AM the next day. Three wheeler taxis (called 'auto rickshaws') can be found everywhere, clogging the streets of Bhadrachalam. They don’t carry meters hence fares are to be bargained based on distance (or your perception of it). At the time of writing (June, 2009) fares to and from most places in the bus stand and temple areas were between 10 and 15 rupees. Bhadrachala Rama Temple is the main temple complex and the abode of Lord Sri Ram – it also has smaller temples of other gods and goddesses. Temples of Lord Shiva and Narasimha are quite close by. The temple is kept open from 5:30 in the morning and stays so till 12:00 in the noon.The temple usually remains closed during the noon hours, and reopens in the evening at 4:00 p.m. The temple will be closed in the night after the last pujas are performed by 8:00 Tiny museum within the temple complex has jewellery Ramdas and others got made for deities of this temple. (The dates of Ramdas’ and Abul Hassan Tanasha's birth and death given on their painted portraits indicate that Ramdas lived for 32 years and Tanasha for 17 years which is rubbish). Edicts made by Ramadas on stone guiding administration of the temple, poojas and other rituals are inside the temple complex written in Telugu. Parnasala is a popular (nearby) place frequently visited by tourists and is 35 km from Bhadrachalam. This is said to be the place where Ravan abducted Sita. A small hut with gaudily painted sculptures of Sri Ram, Sita, Laxman and Ravan depicting key events from Ramayan is what Parnasala is about. This place has great historical importance but weathered sculptures, attempt to replicate the sculptures with fiber glass, lack of maintenance make it a little less satisfied experience. However, passing through tiny tribal hamlets and expansive fields of paddy by a spooky tree lined road plus the serene Godavari River are the saving grace. Its would be a worth while to visit this place if you plan to spend at least 2 or 3 days in Badrachalam. Avoid recommendations from local guides about this place and make your own call. A lovely place with beautiful sceneries of "Pappi Hills" and "Perantalapalli"
Papikondalu Hills - a steam boat ride on River Godavari enjoying views of the River and setting sun. Available as a package of one day including 5 to 7 hours of boat ride. Diesel-powered boats start from Sriramagiri, about 60 km from Bhadrachalam. They offer breakfast, tea, lunch and evening snacks on the boat itself, except lunch where they make special arrangements on the way to papikondalu on the shores of Godavari. The taste & hygiene of the food is good. On the way you can also see the perantallapally, a temple of lord shiva ,where you can find a small water fall coming from the thick forests. A sage used to meditate in this forest. You should maintain utmost silence in the temple. You should not offer any thing (like donations etc). The environment is peaceful. If you have the time, you can do meditation here. On the way you can also visit Sriramagiri temple (58 km. from Bhadrachalam). It is always better to take water, fruit and food with you on the steam boat ride. You have to be cautious before planning trip to Papikondalu during summer as the water levels in River Godavari may cancel the boat trips. Papikondalu Boat Trips, Near Bhadrachalam Temple, ☎ 9440082627. Visiting Papikondalu is a good outing in AC & Non AC Boats. Get the latest information about boats movement and weather etc., Do Visit the main temple. Sit and absorb the atmosphere in the peaceful (on working days) temple premises. Perform different types of pooja – fees for which can be paid right outside the main temple. Attend sessions of Kirtanas written by Ramadas and others in honor of Sri Ram (after 8 pm) Walk along river Godavari through tiny hamlets if the weather is pleasant. Prasadam (food offered to the main deity of the temple) sold outside the main entrance can be a good breakfast as well – especially Laddu, Chakrapongali, Pulihora and Patikabellam (misri) are sold at nominal price right in the temple complex. For breakfast go to Veeranna Hotel near Amba satram to have delicious idly with spicy Ginger chutney..hmmm very tasty. For lunch there is mess at Tata gudi centre to have delicious Telugu vegetarian food. Most restaurants are near bus station and offer the same food fare. Cuisine is South Indian ‘thali' and normal south indian snacks like: Idli, Vada, Poori and Dosa. Branded bottled water (also referred to as Mineral Water, which it isn't) of well known brands are available all over the town. you can prefer pure water. Alcohol drinking strictly prohibited here as it is considered to be a holy place. Hotel "Sudarshan Residency" just opposite to the temple is also a good choice. A/c Double Occupancy costs at Rs.1100/- and this hotel is well maintained. The advantage of this hotel is, it is just opposite to the temple and walkable to both temple and river Godavari. State run Punnami Bhadrachalam has A/C Suites at 1400rs to 1500rs and non A/C rooms at 800rs. (Phone No. 08743231463). This is the best hotel in Bhadrachalam town. Hotel Ratan, located near the Bus Stand - has decent ambience and reasonably clean rooms - twin rooms. It is somewhat noisy with constantly ringing phones resounding through the hotel building (especially in the nights). Room service is non-existent (this may change once an restaurant opens in the hotel, planned for July, 2009).